There’s another avenue that could be used for Al Jazeera – digital sub-channels of broadcast television stations. All hi-def broadcasters can, in addition to their main broadcast channel, offer “sub-channels” in standard def. Some use them in my area to carry alternate programming – a channel consisting only of old movies or tv shows, or Spanish language programming, or even 24-hour hour a day infomercials. Just about all PBS affiliated stations always carry subchannels with kids programming and other options. I’m a happy costumer from French ISP Free, most important TVoIP service in subscribers worldwide. We also have tunisian, egyptian official TV. During Tunisian events, French news channels were doing a good job, but late : when Ben Ali left Tunis, they didn’t said “President” anymore but “Ex-dictator”. This semantic change was very commented on the web. Since the beginning of the Egypt events, AJE is THE network everyone here in France are commenting and watching (when subscribed). AJE is not exactly neutral (and sometimes I don’t agree with their point of vue), but the reporters are making an incredible work. They have lots of local bureaus but refused to “temperate” their reports. Even French journalists follow them and comment them on Twitter with admiration. 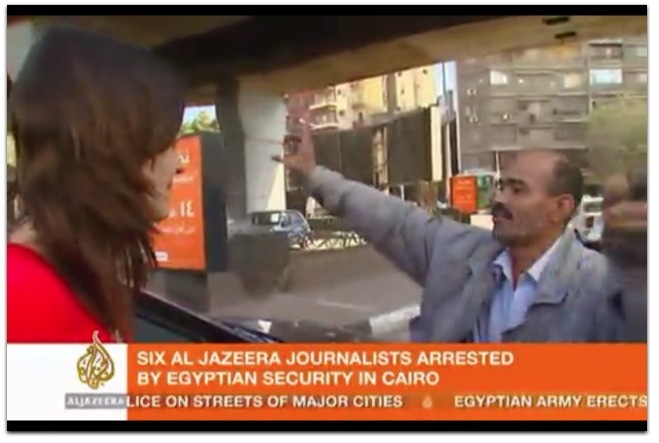 More to say : The two Al Jazeera channels release their reports about actual events in Creative commons. That says that any media can inform, and doing publicity to AJ. If your cable operator refuse to give you choice, it’s also because it is in monopoly. And we can’t have a good democracy by this way. High-speed ISP market was a monopoly here in France, until “Free” came with a revolutionary idea : giving TV with internet, with enough room to have more than 500 channels and per channel subscribing. All cable tv here in France suffered from those ideas and they had to mutate. We’re lucky in the UK to have Al Jazeera as one of the standard channels on Freeview (the national free-to-air digital TV network). It does offer a different and refreshing perspective on world news, and I’ve found myself watching it over BBC News more and more lately. You folks in Europe and elsewhere have an everyday awareness that there are other countries, cultures, languages — and media — surrounding you. Here in the U.S. we’re flanked by two oceans and two countries we mostly ignore. Sad state. You’re mostly there. Raging against the cable companies for not allowing a la carte channels is missing a big part of the problem: the programmers. For example, Disney uses ESPN as a hostage to force programmers to buy all sorts of other channels they (and by extension, you) don’t want or need. They figure that the need for ESPN is so high that they can leverage it to force unpopular channels down our throats instead of trying to market those channels and convince us that we need them. Cable is complicit in this because every time there’s a carriage battle, they put on a good show about “controlling consumer costs” and “standing up for our customers”, but they always cave and pay whatever the programmer demands. And why shouldn’t they? They’ll just pass on the cost to us and while we all grumble, the number of us that actually cancel service are few and far between. Cable still tells themselves that their first-ever quarterly drop in subs is because of the economy, not because they’re pricing themselves out of the market. Given how slow the cable companies have been to realize that they need to fight for their customers, my money is on programmers realizing it first and selling their content directly. Right now, they’re all waiting for someone else to do it first and incur cable’s wrath. Amen to all of that, Jesse. And when they agree on selling content directly, cable won’t be cable any more. Nor will TV. Which is fine. In the long run it’s all files and streams, some of which we pay for and some of which we don’t. Which is why something like Al Jazeera in Egypt is such a why-opener for them. Or should be. Whether they get that clue or not, nature will take its course. I live in Switzerland (I’m an immigrant here). I have Aljazeera English as part of basic cable. I also have TV Montenegro, and a dozen others I can’t figure out because I don’t speak the language, and/or can’t even recognize the character set. When you live in independent, prosperous country that’s not in debt, it’s not afraid of anything. When you are not afraid, your people have freedom. Freedom of information, above all. The freedom to learn what you need to know to keep your country independent and prosperous. I have a brother that works for the networks that “fluff” the news. He prepares the videos that go on air in the morning. He has now been penalized twice for showing an actual needle on the air and showing a body under a sheet. The video rules are more stringent in the mornings than in the evenings. There are a number of Android app’s out for Al-Jazeera including my un-official version (shameless plug http://market.android.com/details?id=com.scottherbert.AJE ) all are in the early stages so it may be too soon to say one is better than the others (my version includes a news reader as well as the live broadcast, as far as I can tell the other just have the broadcast, but I may be wrong on that).